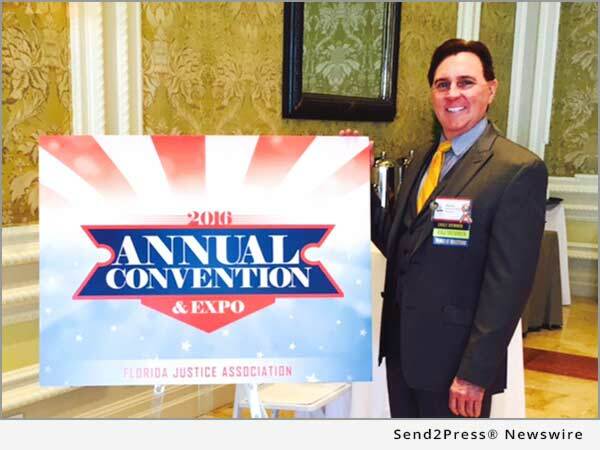 BRADENTON, Fla., Jul 05, 2016 (SEND2PRESS NEWSWIRE) — Bernard Walsh of the personal injury law firm Shapiro Goldman Babboni & Walsh has attended the annual 2016 Florida Justice Association’s convention and meeting of the board of directors. Held at The Breakers Palm Beach, the event draws Florida’s most experienced plaintiff’s attorneys from around the state. Featuring multiple events open to all members of the Florida Justice Association (FJA) as well as several meetings of board members and sub committees on a variety of topics related to the Florida Justice System and consumer and civil rights. Items discussed during the board of directors meeting included several issues in the legislative, political and legal areas important for Florida citizens. Attorney Bernard Walsh and his fellow FJA board members discussed recent legislative changes to the Workers Compensation rules, how new rules on expert witnesses (Daubert vs Frey) will affect the courts, efforts to appeal legislative changes to the cost of obtaining medical records, and efforts to lift the regional based caps on medical mal-practice cases. In addition to strategizing and planning the actions that the Florida Justice Association will take to support a strong civil justice system and protecting the rights of consumers, attendees of the FJY convention had access to a broad range of networking and continuing legal education credit (CLE) opportunities. Bernard F. Walsh is an active volunteer on the Manatee County Sheriff’s Advisory Board, the Sarasota County Sheriff’s Advisory Board, the Florida Highway Patrol Advisory Council and the Manatee County and Florida 100 Clubs for Law Enforcement. Partner at the Personal Injury and Civil Trial Law firm of Shapiro, Goldman, Babboni and Walsh, Bernard Walsh has helped hundreds of Floridians get fair compensation for injuries. Additionally, Bernard Walsh has won one of Florida’s largest motorcycle accident recoveries and has an AV Preeminent(r) rating on Martindale-Hubbell(r), a doctors and attorneys ratings website and is a Superb rated attorney with Avvo.com. *Photo Caption: Personal Injury Attorney Bernard Walsh at the 2016 FJA Convention.